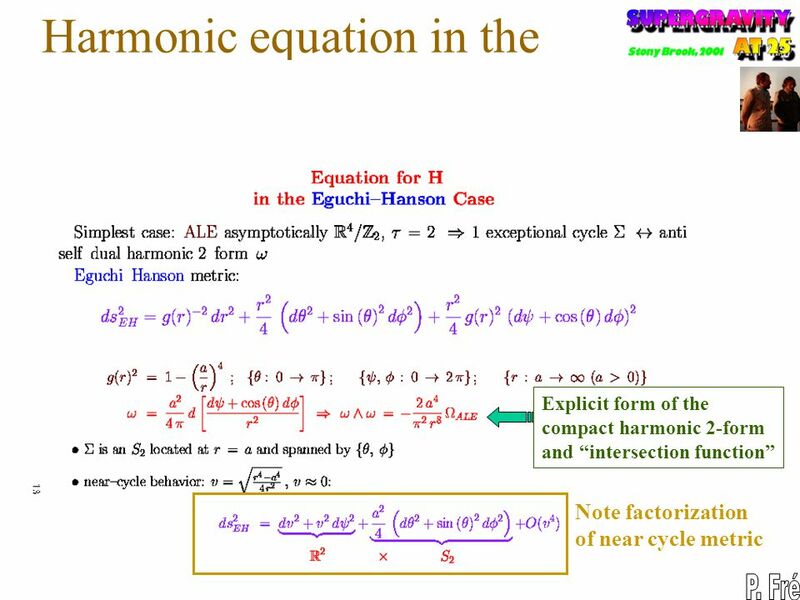 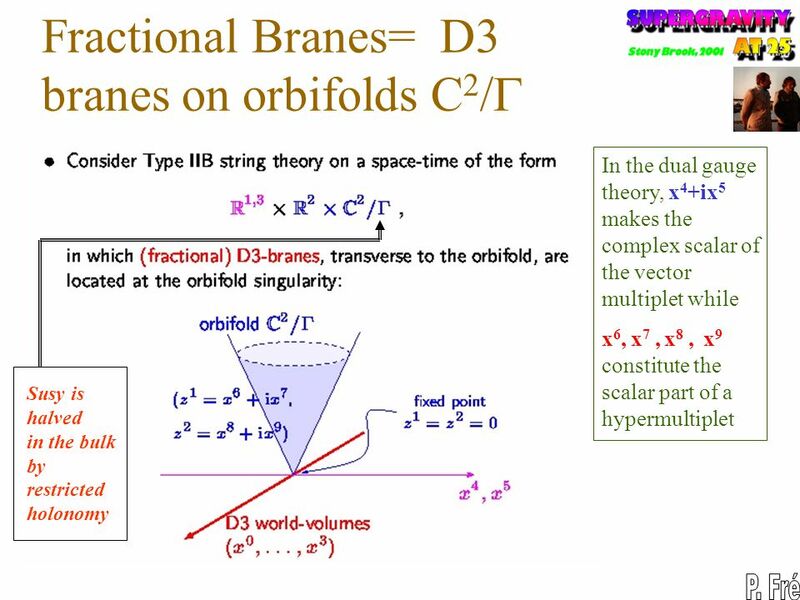 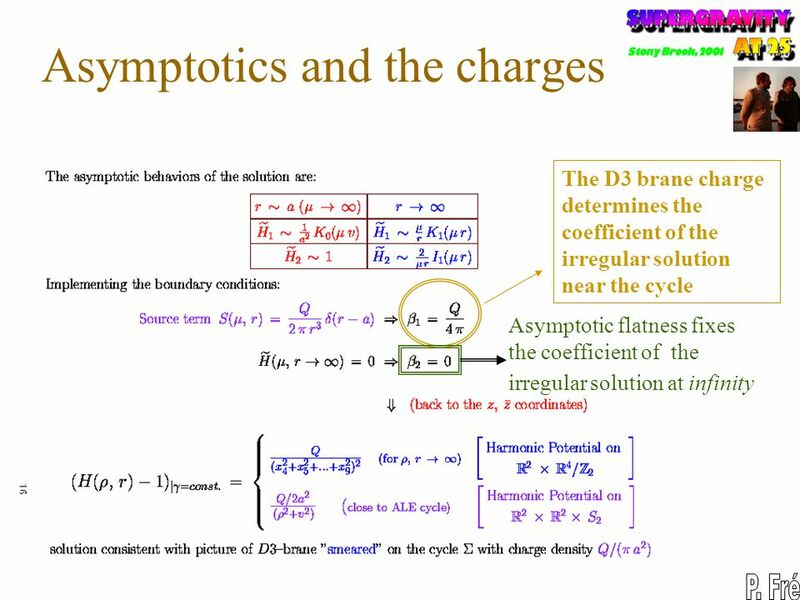 2 Introduction There are interesting solutions of type IIB theory, named fractional D3 branes. 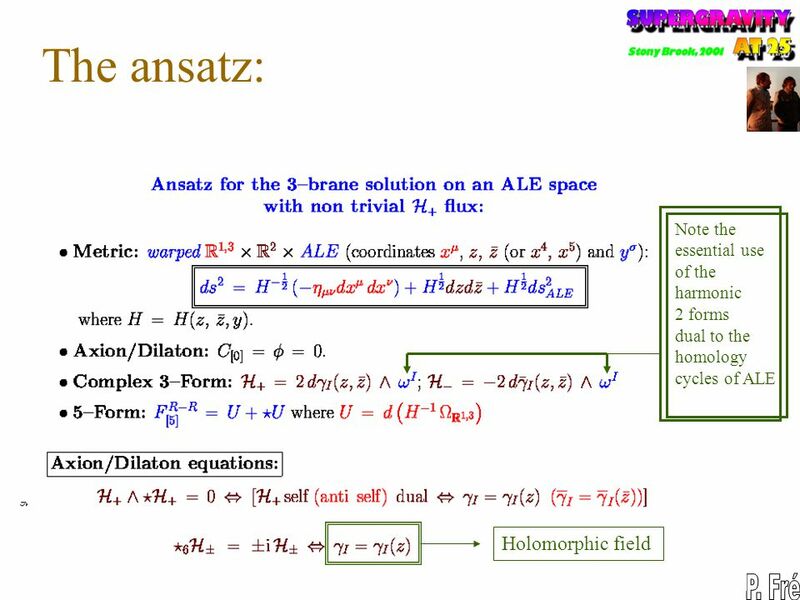 The gauge duals are non-conformal N=2 gauge theories in d=4 Fractional branes are commonly viewed as 5-branes wrapped on a vanishing cycle of transverse space Transverse space is R2 x R4/G. 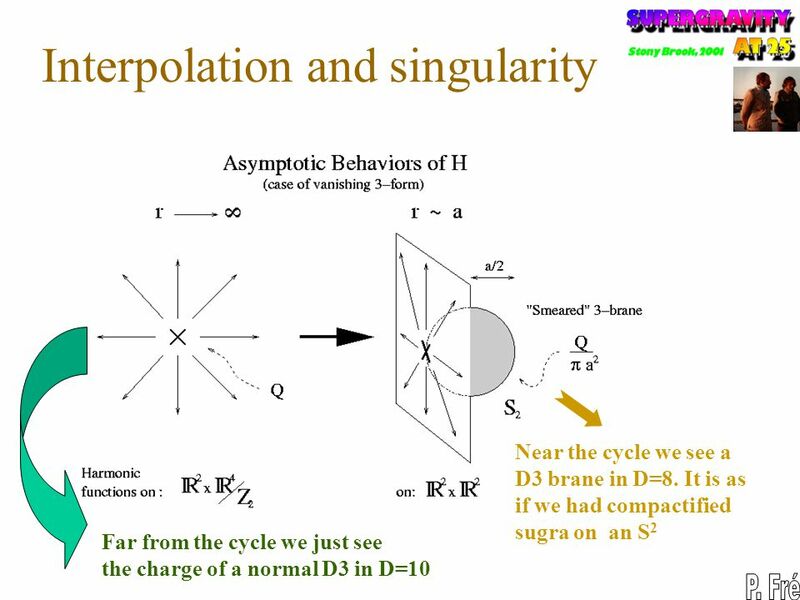 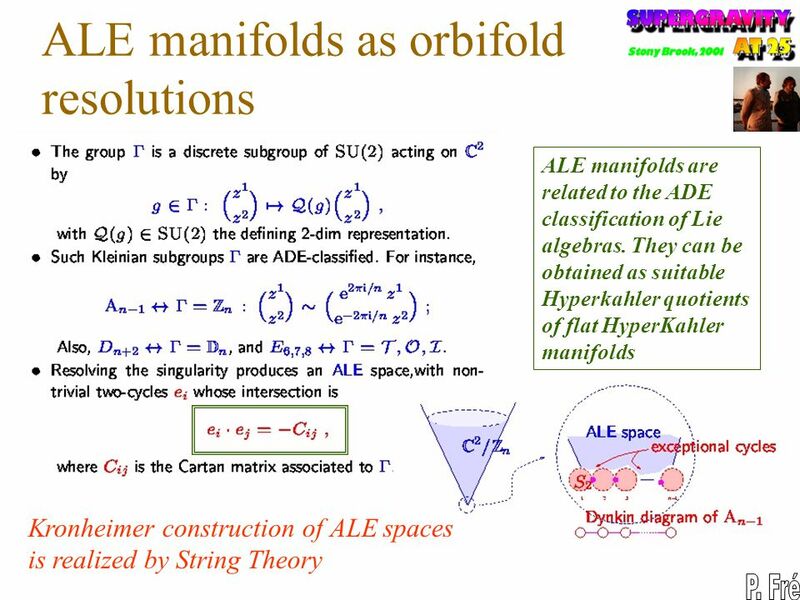 We have found a supersymmetric (BPS) D3-brane solution where transverse space is R2 x ALE In the orbifold limit we recover fractional branes The warp factor is determined by a harmonic equation on ALE In Eguchi Hanson case the harmonic equation reduces to a confluent Heun equation Open questions on the boundary action and the gauge dual. 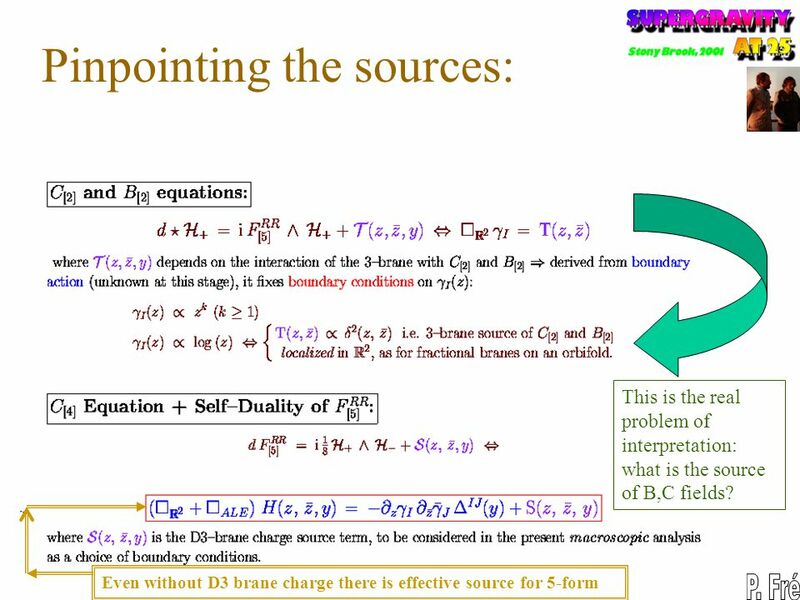 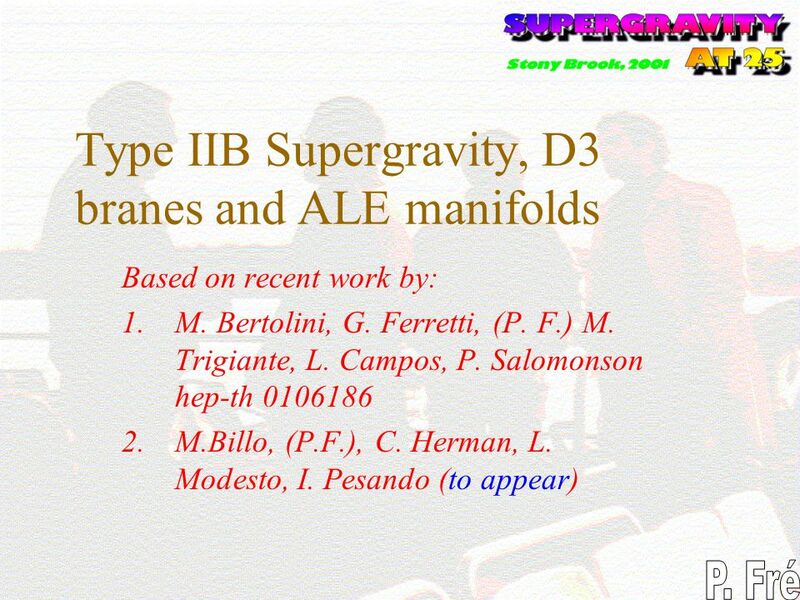 Download ppt "Type IIB Supergravity, D3 branes and ALE manifolds"
Can Integrable Cosmologies fit into Gauged Supergravity? 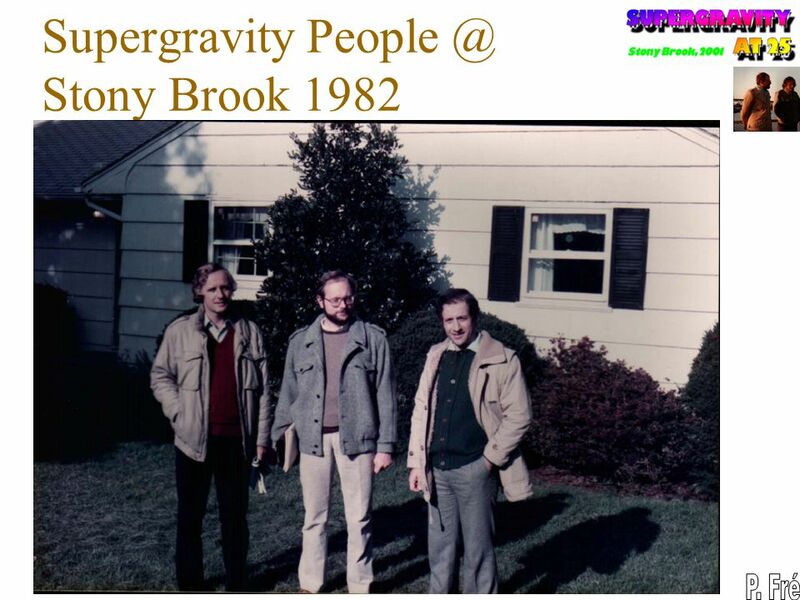 Can Integrable Cosmologies fit into Gauged Supergravity? 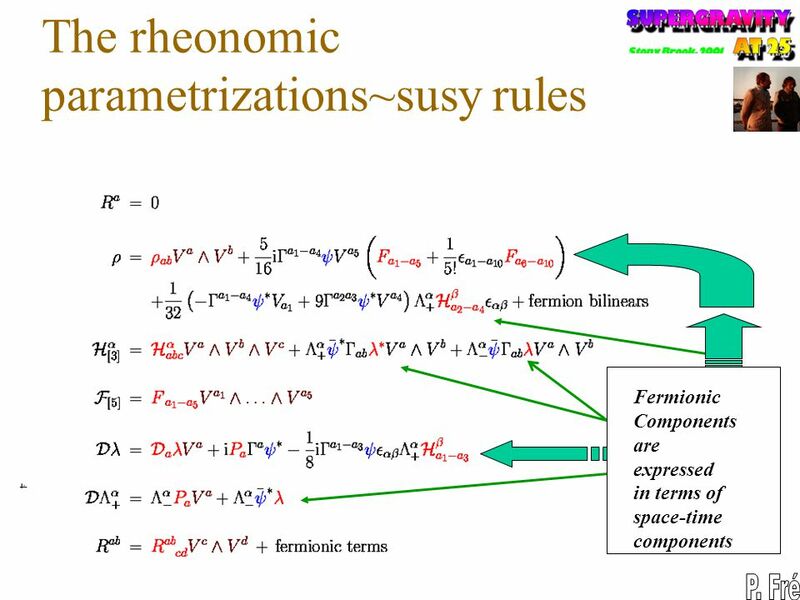 Pietro Frè University of Torino & Embassy. 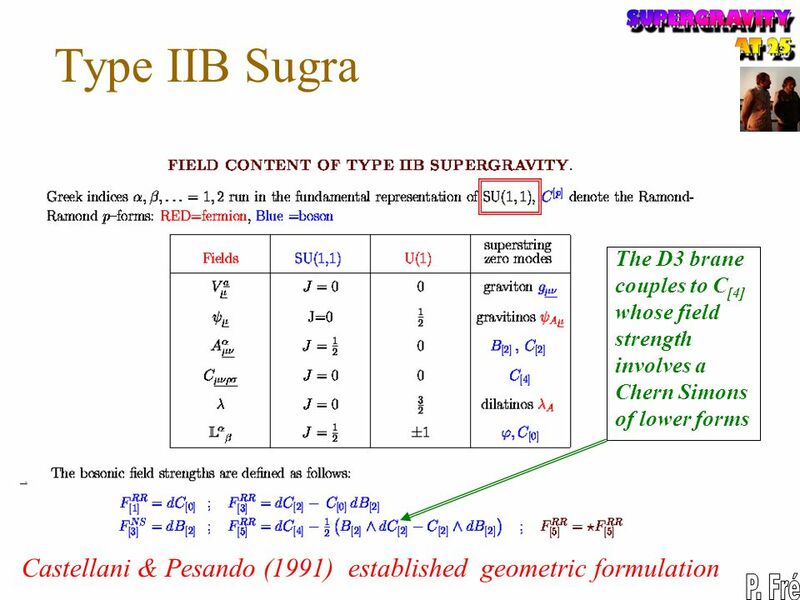 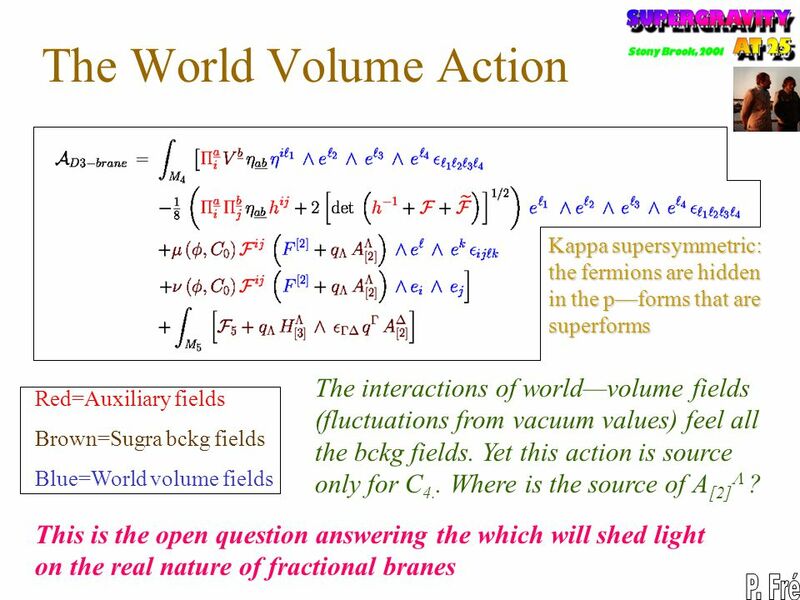 Analysis of QCD via Supergravity S. Sugimoto (YITP) based on hep-th/ (T. Ibaraki + S.S.) Windows to new paradigm in particle Sendai. 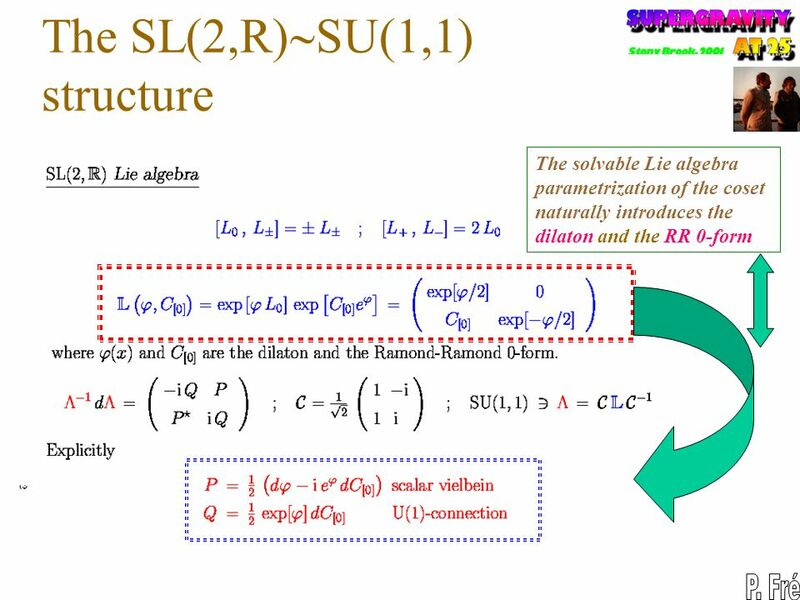 Symmetries and vanishing couplings in string-derived low-energy effective field theory Tatsuo Kobayashi １．Introduction. 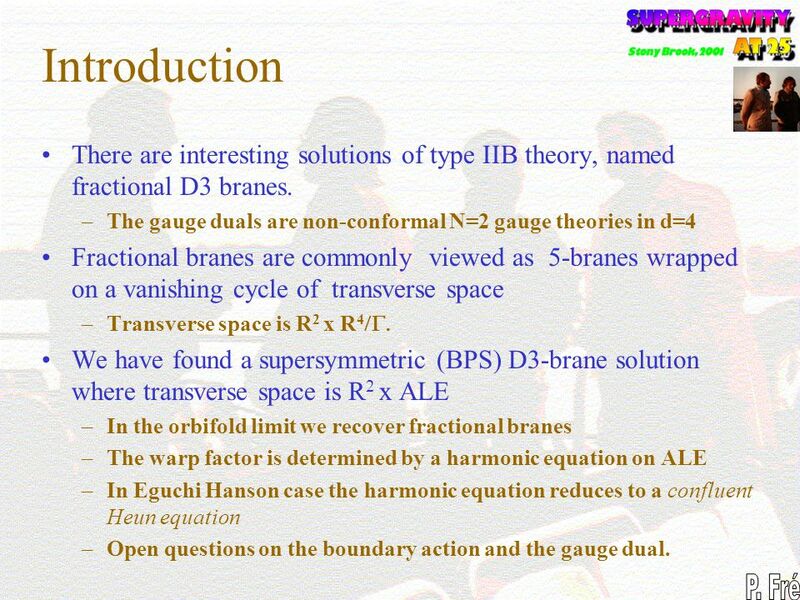 Dp-branes, NS5-branes and U-duality from nonabelian (2,0) theory with Lie 3-algebra Yoshinori Honma (SOKENDAI, KEK) in collaboration with M. Ogawa and. 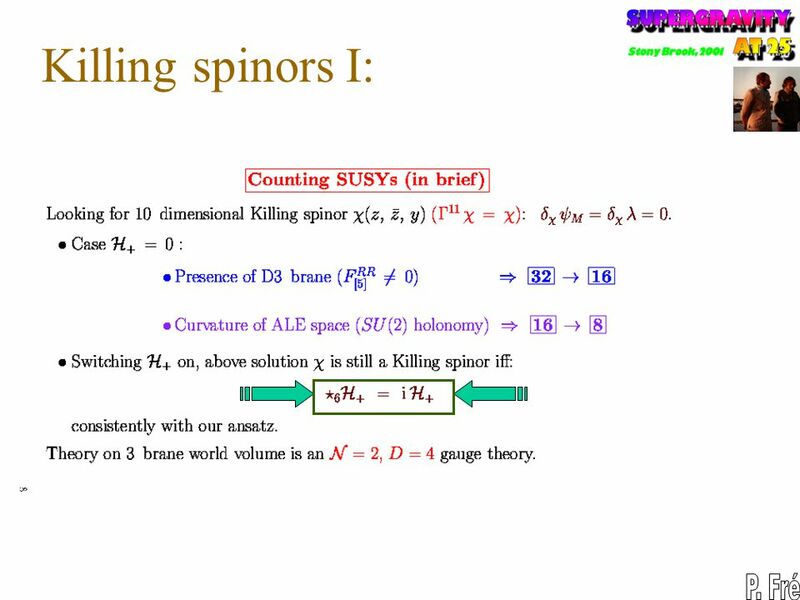 Non-perturbative effects in string theory compactifications Sergey Alexandrov Laboratoire Charles Coulomb Université Montpellier 2 in collaboration with. 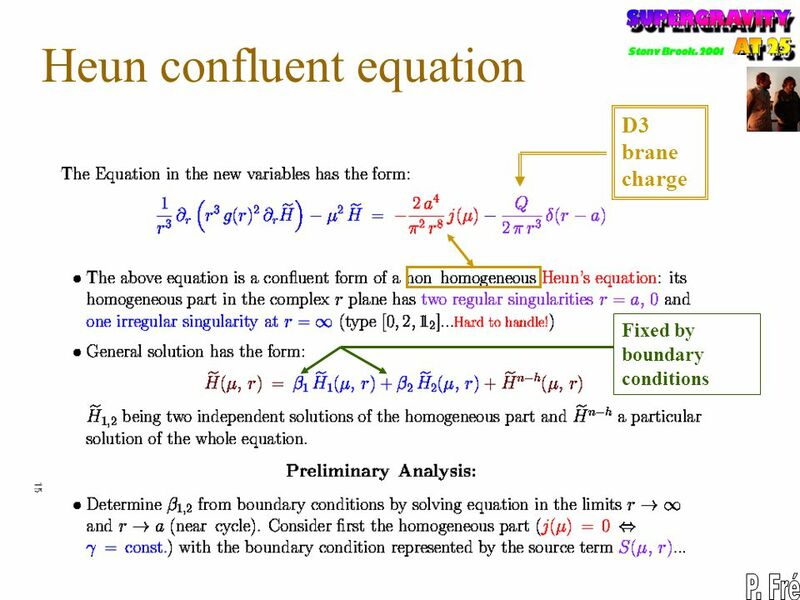 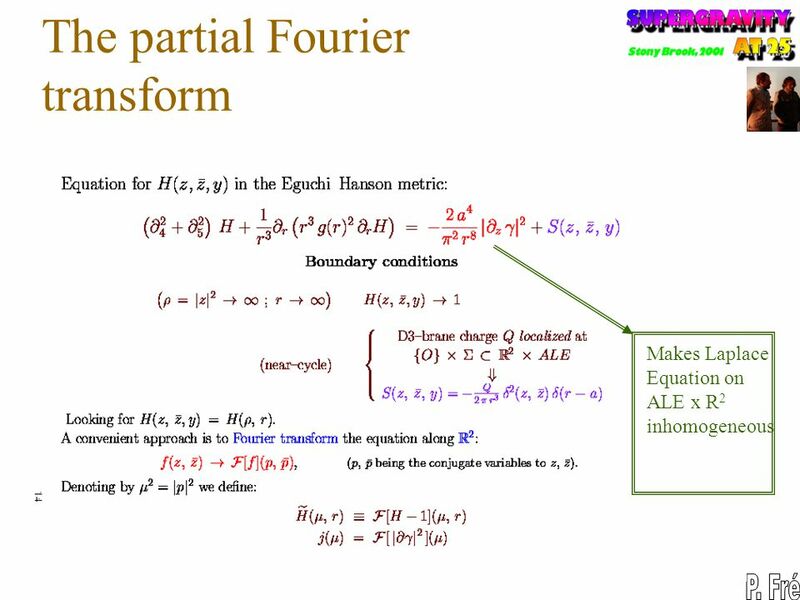 The partition function of fluxed M5-instantons in F-theory Max Kerstan ITP, Universität Heidelberg String Phenomenology 2012, Cambridge Based on work with. 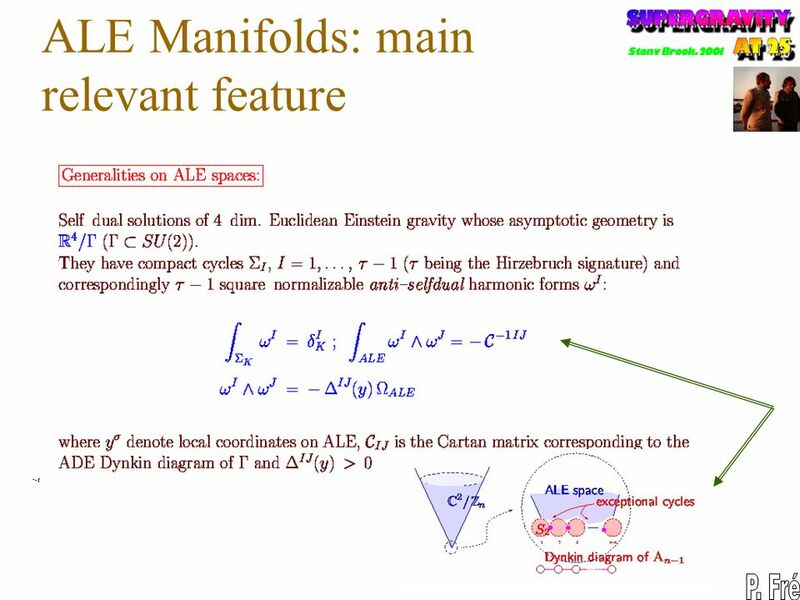 FIRST ORDER FORMALISM FOR NON-SUPERSYMMETRIC MULTI BLACK HOLE CONFIGURATIONS A.Shcherbakov LNF INFN Frascati (Italy) in collaboration with A.Yeranyan Supersymmetry. 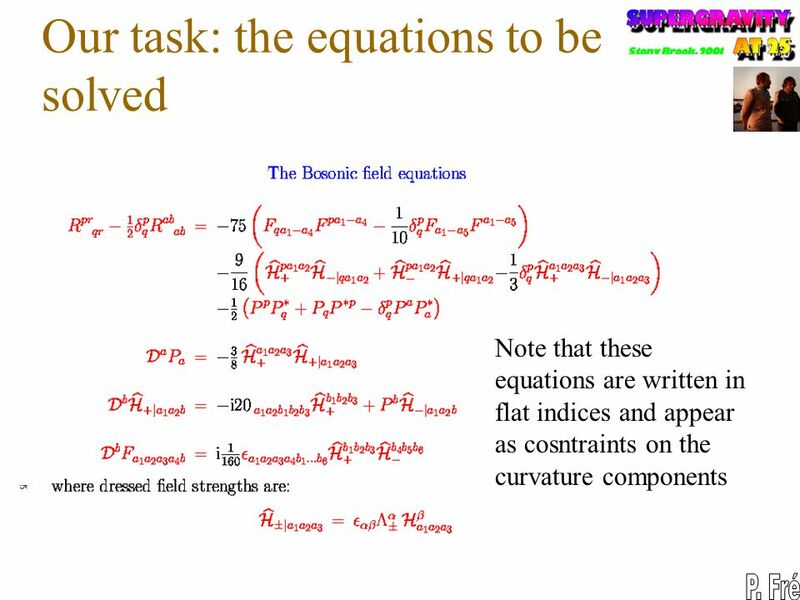 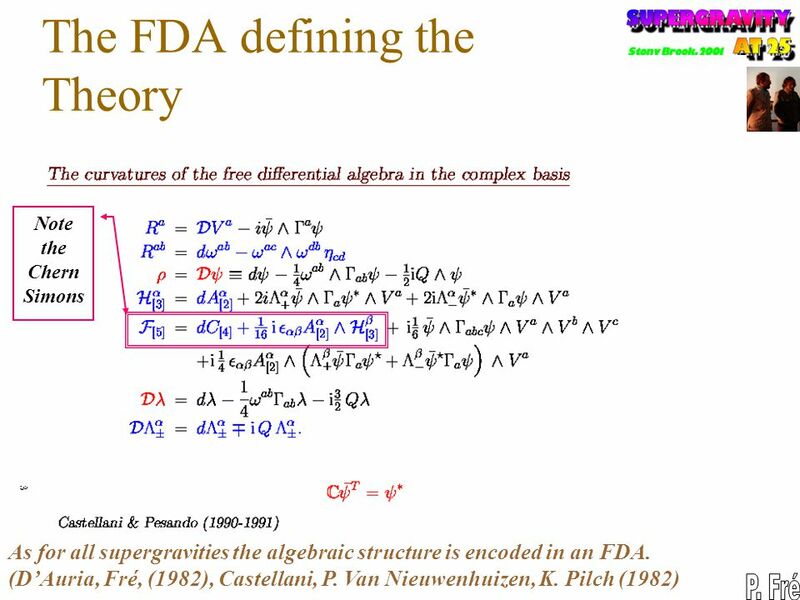 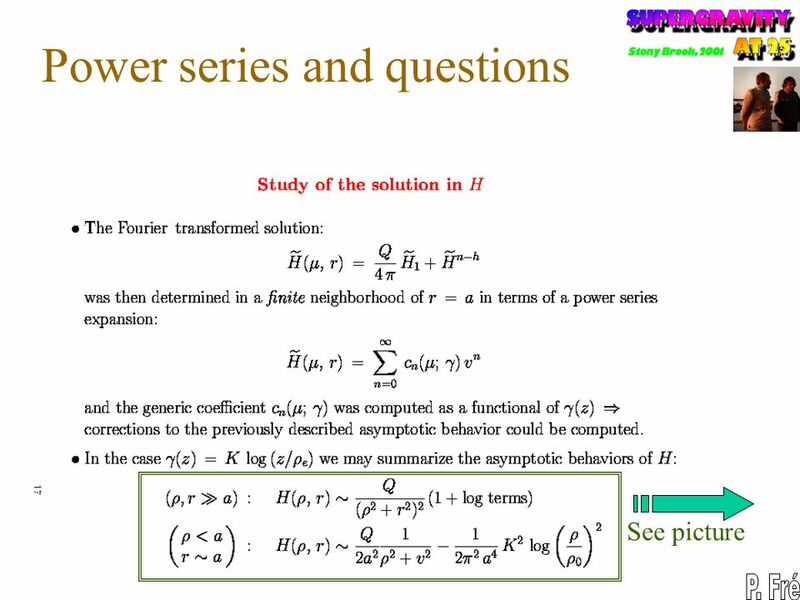 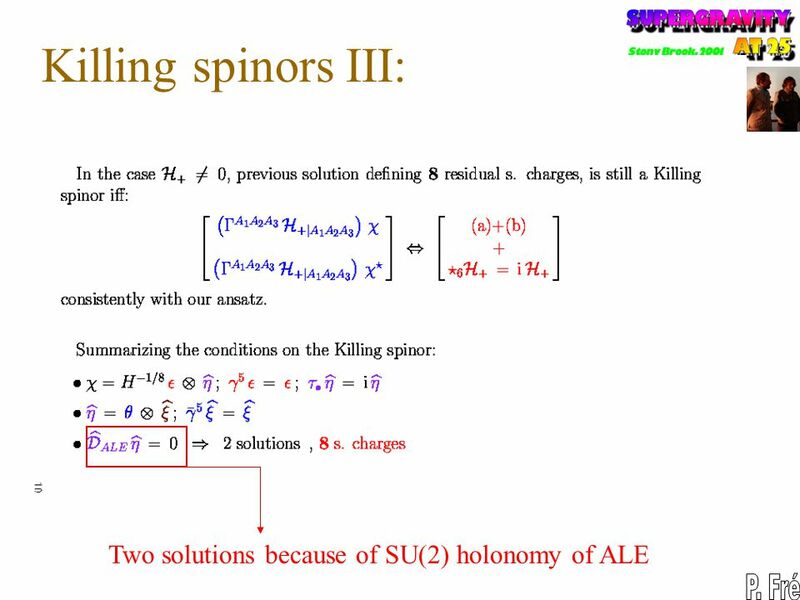 Solvable Lie Algebras in Supergravity and Superstrings Pietro Fré Bonn February 2002 An algebraic characterization of superstring dualities.